Why do BartenderOne MasterClass graduates consistently outperform graduates from other schools? 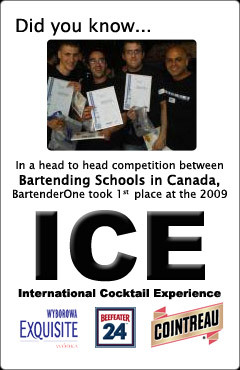 BartenderOne students get one-on-one time with the mixologists who are shaping Canada's Bartending Industry. Despite what other schools say in their advertising, BartenderOne is Canada's ONLY Bartender Training Facility that teaches in actual working nightclubs and bars, which means that as a BartenderOne Graduate, you have actually worked on a real bar. BartenderOne is different than other Bartending Schools. The MasterClass Certification program is the only program designed to deliver real world results to students who have never bartended before by offering a comprehensive list of classes, bartender programs and bar workshops to the hospitality industry. Mixology Schools that deliver just drink recipes are only giving you a small part of what you need to know about being a bartender. At BartenderOne we demand more of our students, and we are committed to providing measurable results to both students and employers. This means as a BartenderOne graduate you are more employable than a graduate from any other Bartending School in Canada.